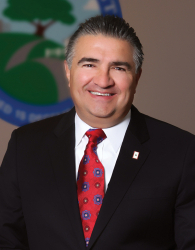 The SCV Water Board of Directors confirmed Los Angeles County Supervisor Katheryn Barger’s appointment of former Assembly member Dante Acosta to its Board of Directors at its special Board meeting, Monday, January 7, 2019. Acosta was sworn in at the meeting and will be representing L.A. County Waterworks District No. 36. Acosta has also served as a member of the City of Santa Clarita City Council and the California State Assembly. Acosta’s appointed term goes through January 1, 2023. At that time, the County’s appointed director position on the board will sunset per the terms of SB 634, SCV Water’s enabling legislation. Over the next four years, the SCV Water Board is set to reduce in size from14 to 9 members, each of them elected. Elections scheduled in November 2020 and November 2022 with three new electoral districts will ensure all customers, including those within areas served by Waterworks District No. 36, continue to have direct representation on the SCV Water Board. There is one appointed director position on the SCV Water Board of Directors, which represents L.A. County Waterworks District No. 36, located in Val Verde. The appointment is filled by the L.A. County Board of Supervisors through a nomination process. They may reappoint the current appointed director, or someone else who is a registered voter within the County of Los Angeles or County of Ventura. The SCV Water Board of Directors may then confirm or reject the nomination. Should the SCV Water Board of Directors reject the nominee, the process would repeat. Upon a second rejection, a third (new) nominee would be confirmed without further action from SCV Water. The County’s prior appointed representative, Dean Efstathiou, served on the former Castaic Lake Water Agency Board and current SCV Water Board for 25 years. Efstathiou was recognized at the December 18, 2018 regular Board meeting for his many years of service.